One of the most important steps to build your client base is customer service! You have to have excellent customer service in order to succeed and have your clients coming back regularly. Communication is also a HUGE part in keeping clients. What do they want? Why? How are you going to achieve their desired look? They are coming to you because they trust you, and you’re the industry professional. In order to carry out the tasks at hand you have to be confident! Confidence radiates from you to your client. As a result, your client leaves not only looking great, but has the confidence to rock his or her new look as well! Taking pride in what you do is another way of building your client base. Take pride in yourself, the way you and your business looks, and how your client looks. There are a few ways outside the salon to build clientele. Advertising is important so that potential clients can see that you are available to do services. You can hand out business cards, run commercials, make a website, and advertise in magazines or newspapers, or whatever it may take to get people to see you! Be available. Availability doesn’t mean working yourself to death, but giving people options. You can’t split into 10 people or take every single walk-in, but make sure you take their information and offer them the next available time slot. Go above and beyond for your clients. Make sure you and your client are always on the same page. 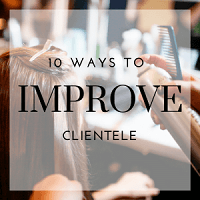 Educate your clients on products, styling tools, and techniques that will give them their desired results. Give them your professional opinion and honesty when it comes to a cut, style, color, etc. Finally, THANK your customers for putting their trust in you and believing in your ability to help them feel great.